What Is Flying Crow Pose And What Are Its Benefits? Eka Pada Galavasana is also called Flying Crow Pose. This pose is a big pose, combines with hip opening with the balance of your arms. In this yoga pose the elements of openness and strength are very essential. Start Practicing: Stand with your feet hips’ width apart. Start by crossing your right ankle on the left of your thigh. Try to bend over your leg that your leg can touches your ground. Now try to wrap your right toes outside your left arm and try to bend your knee more. Now bend your arms slowly, keeping your elbows tucked into your sides. Relax your right foot onto the arms, now slowly and comfortably sift your weight into your hands. Hold for a few breaths and come to Balasana which is also known as Child Pose, before you try this pose for other side. Although, this pose is not for beginners, it is an advanced yoga pose. After a few months of yoga practice one can try this yoga pose. But if beginners can do this pose, with the help of yoga practitioner, they will also can be benefitted from different side, as it helps to grow strengths of arms and wrists. This pose helps to strengthen your arms and wrists. This pose increases your core strength which is very much essential for all types of yoga practice. It also improves an overall sense of balance. It helps in firming and shaping your hips and inner thighs. 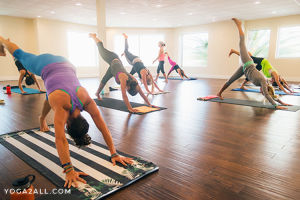 Flying Crow Pose calms your mind by relieving from stress and or anxiety.